LFC: How it feels to be granted official status by the club? Kaushal: It means the world, actually. Although fans never need any incentive to support LFC, this brings us so much closer to the club. And when I say that, it’s not the material things like access to tickets, which is definitely a bonus, but to have real contact with the club means so much to all of us. From the team’s perspective that has worked tirelessly for the past so many years to bring the fans together, it is a great privilege, reward and honour to be recognised by the club and told that we now have the blessings of the club to take it even further. LFC: Why did you decide to launch a supporters’ club? Kaushal: I’m sorry if my answer sounds too common-place but we liked watching games with fellow fans and wanted to extend that facility to others. So, we kept on searching for more fans online and before we knew it, there was a group – a club – of fans who now call themselves DelhiKop. LFC: Why did you pick Liverpool as your team? Kaushal: Personally, my inclination towards club football came about after the 1998 World Cup. I bought myself a copy of a FIFA and after the Argentina-England game with that goal from Michael Owen, I had to pick a team with him in it. For the first few years I followed Liverpool, I did so without even knowing the great heritage of the club, the support that we have, the great heroes we’ve had and I was mad about Liverpool even then. LFC: Who was your first idol for Liverpool? Kaushal: Well, I did start following Liverpool for Michael Owen, so he’ll have to take that position. LFC: Are Liverpool popular in India? Kaushal: Absolutely. I can’t comment on the number of fans Liverpool has with respect to those of other clubs but we have a massive supporter base in India. What I can comment on is the quality of support that Liverpool enjoys here. The fans are immensely passionate about the club. The support at the screenings is amazing, but the fans also understand the club’s values. The supporters never let a fellow fan ‘walk alone’. LFC: What is it about Liverpool that appeals to fans in India? Kaushal: We Indians are proud of our heritage – the history and the culture. We pride ourselves with our strong ‘family values’. If there was ever a club that could resonate those values, it is Liverpool Football Club. There cannot be a more ‘Indian’club. LFC: India is not known as a football-loving country because cricket is so popular. Are you starting to see football and LFC grow in terms of popularity? Kaushal: Cricket is definitely the most popular sport in the country but football being second does not mean it is not loved. Ever since the advent of cable television in India in the early ’90s, football has been growing exponentially. As more and more people follow football, it is only natural for a lot of them to choose to support LFC. 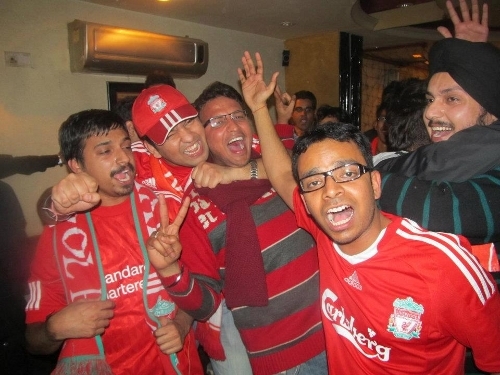 LFC: If fans in India would like to join one of your supporters’ clubs, how would they do it? Kaushal: Our club is open to all fans in the region. There’s a small form on the website they can register themselves on our database. The can also follow us on Facebook and Twitter and of course drop in to our screenings. We’ve never asked for any membership fee and intend to keep it that way. Going forward, we may introduce a ‘premium’ tier of memberships. Kaushal: When you think about it, it means that the club has acknowledged that there is strong support in India and that the club has allocated resources and time so that the fans here can feel closer to the club, can interact with the club, and can connect with more fans across the country. It is a feeling I cannot describe but then that’s what Liverpool Football Club is all about.